Coral reefs are the largest living organism on the planet, home to an incredible amount of biodiversity, but corals around the world are in trouble with widespread bleaching events and disease outbreaks due to rising ocean temperatures. A team of scientists went to the Western Pacific Island chain of Palau to unlock the mysteries of species that may contain a secret of adaptation for survival. Amongst the many gloom and doom stories about corals and our warming oceans, Coral: Glimmer of Hope, filmed in 2018, tells a positive story about the future of the world’s coral reefs. Gaelin Rosenwaks, marine scientist and filmmaker, accompanied the scientists to record their work. Asked why they chose to research and film in the coral reefs of Palau, replied, “In addition to its being one of the most beautiful corners of the planet, Palau is also home to two unique coral habitats, an inshore habitat that is warm and acidic, more analogous to what we think the ocean will look like in the future with warming, and an offshore habitat, that is cooler and has more water flow. “Healthy coral reefs are one of the most valuable ecosystems on Earth. They provide billions of dollars in economic and environmental services, such as food, coastal protection and tourism. However, coral ecosystems face serious threats, mainly from the effects of global climate change, unsustainable fishing and land-based pollution. Hidden beneath the ocean waters, coral reefs teem with life. Fish, corals, lobsters, clams, seahorses, sponges and sea turtles are only a few of the thousands of creatures that rely on reefs for their survival. “Corals are animals, even though they may exhibit some of the characteristics of plants and are often mistaken for rocks. In scientific classification, corals fall under the phylum Cnidaria and the class Anthozoa. They are relatives of jellyfish and anemones. There are more than 800 known species of reef-building coral worldwide and hundreds of species of soft corals and deep-sea corals. “Coral reefs are also living museums and reflect thousands of years of history. Many U.S. coral reefs were alive and thriving centuries ago. Some reefs are even older than our old-growth redwood forests. They are an integral part of many cultures and our natural heritage. Coral reef ecosystem maps released in November 2007, “by NOAA reveal that live coral covers approximately 35 percent of the Republic of Palau’s shallow-water sea floor, a high percentage relative to other areas that NOAA has mapped. The maps are the result of the first comprehensive assessment of the extent and types of Palau’s coral reefs. 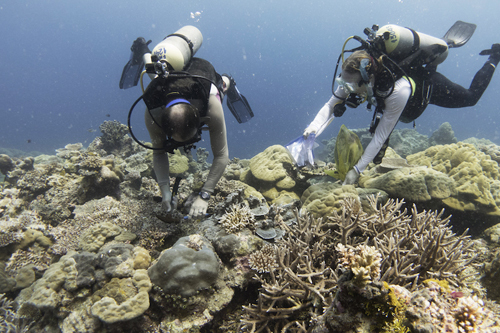 Coral Reef Research Foundation (CRRF) is available at https://coralreefpalau.org/. “CRRF does original research to acquire the knowledge needed to understand and make intelligent decisions related to conservation, climate change and resource management. "Based in the Republic of Palau, surrounded by diverse reefs of the western Pacific, CRRF has a waterfront marine research facility with lab space, accommodation and three research boats. 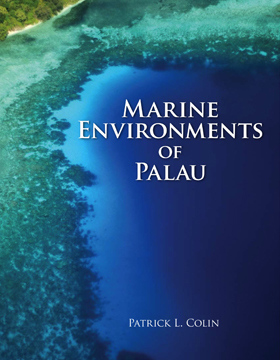 Marine Environments Of Palau: A book by Patrick L. Colin. “Marine Environments of Palau” was an attempt to bring together the diverse information published about the many marine habitats of Palau. To this we added a suite of new information gathered over the years by CRRF, but not yet published. The book was intended to have broad appeal, with color photos on every page to spark the interest of people who are not engaged in reading. There is also generalized scientific information detailed through use of scientific names and citations of the technical literature that readers can access if interested in more detail. "The book achieved its goal of being informative and entertaining, as well as an important resource for Palau." Gaelin Rosenwaks is a marine scientist, explorer, photographer and filmmaker. Always fascinated by the marine world, Gaelin began diving at 14 and has since continued exploring ocean ecosystems. She began her career at the Woods Hole Oceanographic Institution where she researched over-wintering patterns of Southern Ocean zooplankton. Gaelin earned her Master’s Degree in Coastal Environmental Management from Duke University working with the Tag-A-Giant program and conducting research on the migratory movements of Giant Bluefin Tunas. Alarmed by the changes happening in the oceans, Gaelin founded Global Ocean Exploration Inc (GOE) to share her passion for ocean exploration, marine conservation and photography. She now participates in and conducts expeditions in every ocean to alert the public not only to the challenges facing the oceans, but also to what science is doing to understand these changes. Gaelin is a US Coast Guard Licensed Captain, and a Fellow of both the Royal Geographical Society, the Explorers Club and a member of the Society of Women Geographers. She has published articles in scientific journals, newspapers and magazines and has delivered lectures at global conferences and many institutions including the Explorers Club, Patagonia, Inc, Duke University and Yale University. She has appeared as an expert on many TV programs including on The Discovery Channel, CBS News, and Business Insider, and as a presenter and angler on the National Geographic Channel Series, Fish Warrior. Her photography has been displayed in many exhibitions, including solo exhibitions at Duke University, The Maritime Aquarium, and the Patagonia Upper West Side Store in NYC. To Gaelin, there is nothing better than being in the open ocean surrounded by endless blue water and passing wildlife. Published on the Horizon International Solutions Site at http://www.solutions-site.org on 27 March 2019.